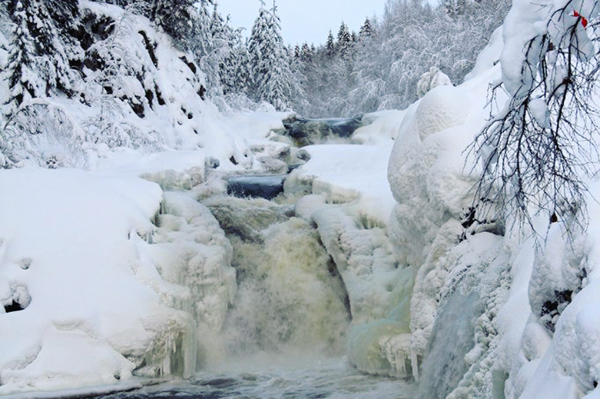 Waterfall Kivach and the church of Apostle Peter are two major sights in Karelia, situated in the vicinity of Petrozavodsk. This tour is a perfect combination of outstanding Russian wooden architecture and beautiful Karelian nature. The first Russian spa, founded by Peter the Great in the 18th century. Till today its waters rich with iron heal from various diseases. You will taste this water from each spring. Visit of the ancient Church of Apostle Peter. Built in 1721 at the decree of Peter the Great, according to his design and drawings. Kivach is the second plain waterfall in Europe, situated in the heart of the nature reserve. You will get acquainted with typical local flora and fauna in the nature museum and with rare plants like Karelian birch in the dendrarium. 10:00 Meeting with the guide in the hotel. Transfer to Martial Waters (50 km). 11:00 Excursion in the church of Apostle Peter . Transfer to the Kivach Nature Reserve. 12:30 Arrival in the Kivach Nature Reserve. Free time to take pictures near the waterfall.